This application is a continuation application of U.S. application Ser. No. 10/308,525, filed Dec. 3, 2002, which claims priority to U.S. Provisional Application Ser. No. 60/338,193 filed Dec. 6, 2001. The present invention relates to compositions and methods for removing and/or reducing incidental soils from fabric articles, especially articles of clothing, linen and drapery, wherein the compositions provide improved cleaning of incidental soils, either with or without a subsequent wash process or other entire fabric care process. The compositions and methods are safe for use on a wide range of fabric articles, even in the home. The occurrence of incidental soils on fabric articles is a fact of life. If these soils cannot be removed from the fabric article, the article cannot be used again for its intended purpose because of its “dirty” appearance. The result is loss of use of an otherwise wearable garment, which is undesirable to the consumer because of the financial loss as well as the emotional attachment that some wearers have with clothing articles. In the home, conventional laundry cleaning is carried out with relatively large amounts of water, typically in a washing machine at the consumer's home, or in a dedicated place such as a coin laundry. Although washing machines and laundry detergents have become quite sophisticated, the conventional laundry process still fails to remove some soils from fabric articles. A wide variety of “pre-treatment” compositions and devices are available to the consumer to assist in soil removal. These compositions often comprise enzymes, bleaching agents and surfactants and require a subsequent aqueous wash to complete soil removal. While effective in cleaning the soil, exposure of the fabric articles to high levels of water in the subsequent wash creates a risk of dye transfer and shrinkage. Moreover, a significant portion of fabric articles used by consumers is not suitable for cleaning in a conventional laundry process. Even fabric articles that are considered “washing machine safe” frequently come out of the laundry process badly wrinkled and require ironing, and may exhibit color loss. More recently, home dry-cleaning kits have become available to the consumer. Some of these kits provide a means of treating incidental soils. However, these compositions comprise water and as such must be tested on fabric articles in an inconspicuous area prior to use, so as to ensure no fabric damage occurs (color bleeding, discoloration, residue formation, localized shrinkage, rings and the like). Additionally, the consumer may desire to remove the incidental soil while still wearing the article, or just prior to re-wearing the article without subsequent treatment. Existing domestic pre-treatment systems can leave undesirable residues on clothing articles, even after an extended period of drying, and may visibly spread the soil over a larger area, creating rings around the original soil. These visible residues may leave the fabric article unusable without subsequent treatment, i.e. washing. Accordingly there is an unmet need for compositions and methods for spot removal of soils from fabric articles which are safe for use in the home, safe for use on a wide range of fabric types including those sensitive to water, and which do not require subsequent conventional washing. In contrast, commercial dry cleaning processes rely on non-aqueous solvents for cleaning. By avoiding water, these processes minimize the risk of shrinkage and wrinkling, however, cleaning of soils, particularly water-based and alcohol-based soils, is very limited with these processes. Typically, the dry-cleaner removes such soils manually prior to the dry-cleaning process. These methods are complex, requiring a wide range of compositions to address the variety of soils encountered, very labor intensive and often result in some localized damage to the treated article despite careful handling by the operator. Further complicating the process is the need to rinse or “level” the spot-treat fluid from the fabric article with solvent to avoid contaminating the non-aqueous fluid in the dry-cleaning machine with the spot-treatment chemicals. Accordingly, there is also an unmet need in the dry-cleaning industry for cleaning compositions and methods that are simple to use, safe for use on dry-cleanable fabric articles, effective on a wide range of soils and which to not require additional treatment steps prior to the dry-cleaning operation. The present invention provides safe-to-use compositions which exhibit improved cleaning (i.e., removing and/or reducing) of incidental soils from fabric articles compared to conventional soil removal compositions, while maintaining excellent fabric care properties. Also provided are methods for utilizing these compositions that require no additional treatment steps before an optional subsequent cleaning or refreshing step. In general, compositions and methods of the present invention fall into two categories: (i) treating compositions and/or methods that modify, typically by chemically reacting with, one or more soil components to render the soil more soluble in a lipophilic fluid, especially in a silicone comprising solvent, as compared to the unmodified form of the soil components; and (ii) treating compositions and/or methods that modify, typically by chemically reacting with, one or more soil components to render the soil more soluble in a lipophilic fluid, for example more hydrophobic, as compared to the unmodified form of the soil components. The treating compositions of the present invention are typically formulated with additional cleaning ingredients, including solvents, surfactants, polymers, wetting agents, and/or hydrotropes. In one aspect of the present invention, a method for removing and/or reducing an incidental soil from a fabric article in need of treatment comprising: a) contacting the soil present on the fabric article with a treating composition comprising: i) a non-aqueous fluid; ii) a protein derivitazation reagent capable of modifying the soil to enhance removal benefits upon contact with a lipophilic fluid; and b) optionally, removing a portion of the composition from the fabric article; and c) optionally, placing the treated fabric article into a subsequent cleaning process, preferably a cleaning process that utilizes a lipophilic fluid, such that the fabric article is treated, is provided. In another aspect of the invention, a method for removing and/or reducing an incidental soil from a fabric article in need of treatment comprising: a) contacting the soil present on the fabric article with a treating composition comprising: i) a non-aqueous fluid; ii) a protein derivitazation reagent capable of modifying the soil to enhance removal benefits upon contact with a lipophilic fluid; and b) optionally, removing a portion of the composition from the fabric article; and c) optionally, placing the treated fabric article into a subsequent cleaning process, preferably a cleaning process that utilizes a lipophilic fluid, such that the fabric article is treated, is provided. In yet another aspect of the invention, a method for removing and/or reducing an incidental soil from a fabric article in need of treatment comprising: a) contacting the soil present on the fabric article with a composition comprising: i) a non-aqueous fluid; ii) a protein derivitazation reagent capable of modifying the soil to enhance removal benefits upon contact with a lipophilic fluid; and placing the treated fabric article into a subsequent cleaning process, preferably a cleaning process that utilizes a silicone-containing lipophilic fluid, more preferably a cleaning process that utilizes a D5-containing cleaning fluid, such that the fabric article is treated, is provided. (ii) laundering the entire treated fabric article from step (i) in a drycleaning laundering process, such that the fabric article is treated, is provided. (ii) drying the fabric article, such as by air drying and/or by placing the fabric article in a device, preferably a hot air clothes dryer, to provide agitation and agitating the fabric article to dry the fabric, such that the fabric article is treated, is provided. (iv) optionally, an absorbent soil receiver article. Accordingly, the present invention provides methods for removing and/or reducing incidental soils present on articles, preferably fabric articles, that avoids negative wicking effects, and compositions and/or products and/or kits typically comprising instructions for utilizing the methods and/or compositions and/or products and/or kits to remove and/or reduce incidental soils present on an article. These and other aspects, features and advantages will become apparent to those of ordinary skill in the art from a reading of the following detailed description and the appended claims. All percentages, ratios and proportions herein are by weight, unless otherwise specified. All temperatures are in degrees Celsius (o C) unless otherwise specified. All measurements are in SI units unless otherwise specified. All documents cited are in relevant part, incorporated herein by reference. The term “fabric article” and/or “fabric” used herein is intended to mean any article that is customarily cleaned in a conventional laundry process or in a dry cleaning process. As such the term encompasses articles of clothing, linen, drapery, and clothing accessories. The term also encompasses other items made in whole or in part of fabric, such as tote bags, furniture covers, tarpaulins and the like. The term “volatile silicone’ describes the well-know class of materials exemplified by the oligomers of dimethyl siloxane. The oligomers may be linear, branched or cyclic in nature. Preferred volatile silicones of the present invention are those that do not leave a visible residue at the end of the cleaning process. In general, preferred siloxane oligomers are those with a boiling point under normal conditions of 240° C. or lower. The term “incidental soil” and/or “soil” refers to undesirable materials that are found on the fabric article. Generally, such incidental soils are found only on a portion of the article and are generated by accidental contact between the soil and the fabric article. Non-limiting examples of incidental soils are beverages, food sauces and condiments, bodily fluids such as blood, urine and feces, outdoor soils such as grass, mud and dirt, cosmetics such as make-up and lipstick. Such incidental soils are also commonly referred to as “stains”. The term “incidental soils” as used herein does not include soils, such as sebum (skin secretions), oil and/or grease that are spread out over large portions of the fabric article. The incidental soils typically comprise functional groups selected from the group consisting of: alcohols, amides, amines, amino acids, carbohydrates, sugars and mixtures thereof. Such functional groups are not typically readily soluble in lipophilic fluids, thus, the need to make them more soluble by modifying such groups as described herein. The concept of “modifying a soil and/or a soil component” as used herein means any action taken upon the soil, typically by a chemical reaction, that results in the soil being more soluble in a lipophilic fluid as compared to the soil in its unmodified state. Nonlimiting examples of actions that can be taken upon the soil include, elimination of polar groups, such as —OH, —NH and/or —SH groups, which the incidental soils typically contain. Known methods for modifying soils include, but are not limited to, silylation, alkylation and acylation. Agents capable of modifying the soils are herein described as incidental soil modifying agents (alternatively “derivatization reagents”). Nonlimiting examples of silylating reagents useful in silylation methods include hexamethyldisilzane, trimethylchlorosilane, trimethylsilylimidazole, bistrimethylsilylacetamide, bistrimethylsilyltrifluoroacetamide, N-methyl-trimethylsilylfluoroacetamide, trimethylsilyldiethylamine, N-methyl-N-t-butyldimethylsilyltrifluoroacetamide, and halo-methylsilyl-containing materials. “Alkylation” reduces molecular polarity by replacing active hydrogens with an alkyl group. Alkylating reagents are typically used to modify compounds with acidic hydrogens, such as carboxylic acids and phenols. These reagents produce esters, ethers, alkyl amines and alkyl amides. Nonlimiting examples of alkylating reagents for use in alkylation include dialkylacetals, tetrabutylammonium hydroxide, BF3, and pentafluorobenzyl bromide. “Acylation” reduces the polarity of amino, hydroxyl, and thiol groups and adds halogenated functionalities to the soils. In comparison to silylating reagents, the acylating reagents target highly polar, multi-functional compounds, such as carbohydrates and amino acids. Acylation converts such compounds with active hydrogens into esters, thioesters, and amides. Nonlimiting examples of acylating reagents useful in acylation methods include acyl anhydrides, such as fluorinated anhydrides (i.e., trifluoroacetoic anhydride, pentafluoropropionic anhydride, heptafluorobutyric anhydride), acyl halides, such as pentafluorobenzoyl chloride, fluoroacylimidazoles, such as trifluoroacetylimidazole, pentafluoropropanylimidazole, heptafluorobutyrylimidazole, pentafluoropropanol, and activated acyl amides, such as N-methyl-bis(trifluoroacetamide). The term “treating composition” as used herein is intended to mean a composition comprising an incidental soil modifying agent (i.e, derivatization reagents). The term “cleaning composition” used herein is intended to mean any lipophilic fluid-containing composition that comes into direct contact with fabric articles to be cleaned. It should be understood that the term encompasses uses other than cleaning, such as conditioning and sizing. The term “capable of suspending water in a lipophilic fluid” means that a material is able to suspend, solvate or emulsify water, which is immiscible with the lipophilic fluid, at a level of 5% by weight of the composition in a way that the water remains visibly suspended, solvated or emulsified when left undisturbed for a period of at least five minutes after initial mixing of the components. In some examples of compositions in accordance with the present invention, the compositions may be colloidal in nature and/or appear milky. In other examples of compositions in accordance with the present invention, the compositions may be transparent. The term “mixing” as used herein means combining two or more materials (i.e., fluids, more specifically a lipophilic fluid and a consumable detergent composition) in such a way that a homogeneous mixture is formed. Suitable mixing processes are known in the art. Non-limiting examples of suitable mixing processes include vortex mixing processes and static mixing processes. The present invention provides compositions which exhibit improved cleaning (i.e., removal and/or reduction) of incidental soils from fabric articles while maintaining excellent fabric care properties. Blood proteins are hydrophilic polymers which contain large amount of hydrophilic functional groups such as amide, amine, hydroxyl, mercapto, carboxylic groups. These are among the toughtest soil to clean in a lipophilic fluid cleaning system. Soil modifying agents (i.e., derivatization reagents) commonly used in analytical chemistry for chromatography separation and fluororencent labeling are applied to blood protein modification-hydrophobization. Hydrophobization of the blood stain improved the cleaning performance in D5 macroemulsion system. The preferred hydrophobization reagents in the present invention are: (1) silylation: a solution with ratio of 3:1:9:1 of hexamethyldisilazane:trimethylchlorosilane:pyridine:N,O-bis-(trimethylsilyl) acetamide; (2) isoindolation: 2-(a) a solution with ratio of 1000:1 of o-phthaldialdehyde:2-mercaptoethanol; 2-(b) hydrophobically modified analogs of o-phthaldialdehyde, such as HCOC6H4CN(Si(CH3)2O)n—X or HCOC6H4CH2NH(Si(CH3)2O)n—X, wherein n is 2-50, X is H, CH3, OH, NH2, or alkyl or PDMS derivatized o-phthaldialdehyde; (3) isothiocyanation (to form phenyl or alkyl thiohydantoins): phenyl isothiocyanate or C1-C8 alkyl isothiocyanate; (4) alkylene oxide, e.g. 1,2-epoxybutane; (5) PDMS branched with alkylene oxide, e.g., X—(Si(CH3)2O)m—(SiO(CH3)((CH2)a—OCH2-CHOCH2)))—(Si(CH3)2O)n—X, wherein m is 1-10, n is 1-10, a is 1-5, X is H, CH3, OH, NH2; or CH2OCHCH2O(CH2)3Si(CH3)2O(Si(CH3)2O)nSi(CH3)2(CH2)3OCH2CHOCH2 of Gelest, Inc.; or CH3Si(CH3)2O(Si(CH3)2O)m(Si(CH3)(CH2CH2C6H9O)O)nSi(CH3)2CH3 of Gelest, wherein n is 1-50, m is 1-50; (6) epichlorohydrin; (7) CNBr; (8) alkyl aldehyde and NaCNBH3. An emulsion or co-solvent system consists of D5, H2O and surfactant or solvent removes these hydrophobically modified blood proteins. The system consists of 85% -100% of D5, 5% -15% of H2O, 0.5%-3% of surfactant or 80%-100% of D5, 0.5% -15% of H2O, 0.5%-20% of solvent. Surfactants can be AES, LAS, Ca— or NH4— LAS, PDMS or twin alkyl branched with peptide or alkyl ethoxylate or amino alkyl or alkyl ethoxylated sulfate or sugar. 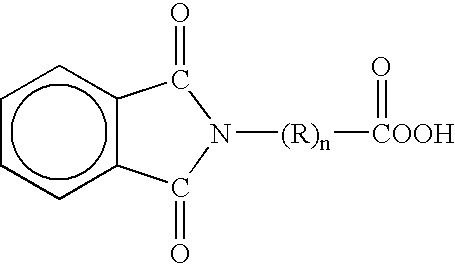 Solvents can be polar solvents like TFA, MEA, DEA, alcohols (n=1-4), alkylene diols (n=1-5), acetonitrile, DMF, CHCl3, trichloroethan, urea, DMSO, etc. The treating compositions of the present invention typically comprise a surfactant in addition to the soil modifying agent. The surfactant component of the present invention is a material that is capable of suspending water in a lipophilic fluid and enhancing soil removal benefits of a lipophilic fluid. As a condition of their performance, the materials are soluble in the lipophilic fluid. Nonlimiting commercially available examples of suitable siloxane-based surfactants are TSF 4446® (ex. General Electric Silicones) and Y12147® (ex. OSi Specialties). A second preferred class of materials suitable for the surfactant component is organic in nature. Preferred materials are organosulfosuccinate surfactants, with carbon chains of from about 6 to about 20 carbon atoms. Most preferred are organosulfosuccinates containing dialkyl chains, each with carbon chains of from about 6 to about 20 carbon atoms. Also preferred are chains containing aryl or alkyl aryl, substituted or unsubstituted, branched or linear, saturated or unsaturated groups. Nonlimiting commercially available examples of suitable organosulfosuccinate surfactants are available under the trade names of Aerosol OT® and Aerosol TR-70® (ex. Cytec). Suitable amino-functional silicones for use in the compositions of the present invention have the formula described above for the surfactant component, with the exception that the D″ is R5 2SiO2/2 wherein R5 is (CH2)f—(C6H4)z O—R6 where R6 is an amino-containing alkyl group. Nonlimiting commercially available examples of suitable amino-functional silicones are available under the trade names of XS69-B5476® (ex. General Electric Silicones) and Jenamine HSX® (ex. DelCon). Compositions according to the present invention may further comprise a polar solvent. Non-limiting examples of polar solvents include: water, alcohols, glycols, polyglycols, ethers, carbonates, dibasic esters, ketones, other oxygenated solvents, and mixtures thereof. Further examples of alcohols include: C1-C126 alcohols, such as propanol, ethanol, isopropyl alcohol, etc., benzyl alcohol, and diols such as 1,2-hexanediol. The Dowanol® series by Dow Chemical are examples of glycols and polyglycols useful in the present invention, such as Dowanol® TPM, TPnP, DPnB, DPnP, TPnB, PPh, DPM, DPMA, DB, and others. Further examples include propylene glycol, butylene glycol, polybutylene glycol and more hydrophobic glycols. Examples of carbonate solvents are ethylene, propylene and butylene carbonantes such as those available under the Jeffsol® tradename. Polar solvents for the present invention can be further identified through their dispersive (δD), polar (δP) and hydrogen bonding (δH) Hansen solubility parameters. Preferred polar solvents or polar solvent mixtures have fractional polar (fP) and fractional hydrogen bonding (fH) values of fP>0.02 and fH>0.10, where fP=δP/(δD+δP+δH) and fH=δH/(δD+δP+δH) more preferably fP>0.05 and fH>0.20, and most preferably fP>0.07 and fH>0.30. The compositions of the present invention optionally further comprise at least one additional cleaning adjunct. The cleaning adjuncts can vary widely and can be used at widely ranging levels. For example, detersive enzymes such as proteases, amylases, cellulases, lipases and the like as well as bleach catalysts including the macrocyclic types having manganese or similar transition metals all useful in laundry and cleaning products can be used herein at very low, or less commonly, higher levels. Cleaning adjuncts that are catalytic, for example enzymes, can be used in “forward” or “reverse” modes, a discovery independently useful from the fabric treating methods of the present invention. For example, a lipolase or other hydrolase may be used, optionally in the presence of alcohols as cleaning adjuncts, to convert fatty acids to esters, thereby increasing their solubility in the lipophilic fluid. This is a “reverse” operation, in contrast with the normal use of this hydrolase in water to convert a less water-soluble fatty ester to a more water-soluble material. In any event, any cleaning adjunct must be suitable for use in combination with a lipophilic fluid in accordance with the present invention. Some suitable cleaning adjuncts include, but are not limited to, builders, surfactants, other than those described above with respect to the surfactant component, enzymes, bleach activators, bleach catalysts, bleach boosters, bleaches, alkalinity sources, antibacterial agents, colorants, perfumes, pro-perfumes, finishing aids, lime soap dispersants, odor control agents, odor neutralizers, polymeric dye transfer inhibiting agents, crystal growth inhibitors, photobleaches, heavy metal ion sequestrants, anti-tarnishing agents, anti-microbial agents, anti-oxidants, anti-redeposition agents, soil release polymers, electrolytes, pH modifiers, thickeners, abrasives, divalent or trivalent ions, metal ion salts, enzyme stabilizers, corrosion inhibitors, diamines or polyamines and/or their alkoxylates, suds stabilizing polymers, solvents, process aids, fabric softening agents, optical brighteners, hydrotropes, suds or foam suppressors, suds or foam boosters and mixtures thereof. Hydrogen peroxide is a highly preferred bleaching agent. In a typical method of soil removal of the present invention, the soil removal and/or reducing composition of the present invention is used in conjunction with an absorbent soil receiver and is releasably housed within a container, which is provided with a dispensing means. (The combination of container and its dispensing means is herein referred to conjointly as the “dispenser”). In the process of this invention, a fabric is inspected for any localized area of stain. The soiled area is then placed in close contact with an absorbent soil receiver and treated by means of the dispenser. As discussed herein, the compositions of the present invention may be employed in a process for removing and/or reducing a soil from a localized stained area on a fabric article, comprising the steps of placing the soiled area of the fabric over and in contact with an absorbent soil receiver; applying a composition according to the present invention to the soil, preferably from a container having a dispenser spout. The absorbent soil receiver that is used in the pre-spotting operation herein can be any absorbent material, which imbibes the composition of the present invention used in the pre-spotting operation. Disposable paper towels, cloth towels such as BOUNTY® brand towels, clean rags, etc., can be used. However, in a preferred mode the absorbent soil receiver is designed specifically to “wick” or “draw” the soil removal composition away from the soiled area. A preferred receiver consists of a nonwoven pad. In a preferred embodiment, the overall nonwoven is an absorbent structure composed of about 72% wood pulp and about 28% bicomponent staple fiber polyethylene-polypropylene (PE/PP). It is about 60 mils thick. It optionally, but preferably, has a barrier film on its rear surface to prevent the soil removal composition from passing onto the surface on which the pre-spotting operation is being conducted. The receiver's structure establishes a capillary gradient from its upper, fluid receiving layer to its lower layer. The gradient is achieved by controlling the density of the overall material and by layering the components such that there is lower capillary suction in the upper layer and greater capillary suction force within the lower layer. The lower capillary suction comes from having greater synthetic staple fiber content in the upper layer (these fibers have surfaces with higher contact angles, and correspondingly lower affinity for water, than wood pulp fibers) than in the lower layer. For pre-spotting, the soiled area of the garment or fabric swatch is placed over a section of the soil receiver, followed by treatment with the soil removal composition of the present invention, preferably in conjunction with the tip of the dispenser tube to provide mechanical agitation. Repeated manipulations with the tip and the detergency effect of the soil removal composition serve to loosen the soil and transfer it to the receiver. While spot cleaning progresses, the suction effects of the receiver capillaries cause the soil removal composition and soil debris to be carried into the receiver, where the soil debris is largely retained. At the end of this step the soil as well as almost all of the soil removal composition is found to have been removed from the fabric being treated and transferred to the receiver. This leaves the fabric surface only damp, with little or no residue of the soil removal composition/soil debris that can lead to undesirable rings on the fabrics. A typical dispenser herein has the following dimensions, which are not to be considered limiting thereof. The volume of the container bottle used on the dispenser is typically 2 oz.-4 oz. (fluid ounces; 59 mls to 118 mls). The container larger size bottle can be high density polyethylene. Low density polyethylene is preferably used for the smaller bottle since it is easier to squeeze. The overall length of the spout is about 0.747 inches (1.89 cm). The spout is of a generally conical shape, with a diameter at its proximal base (where it joins with the container bottle) of about 0.596 inches (1.51 cm) and at its distal of 0.182 inches (4.6 mm). The diameter of the channel within the spout through which the pre-spotting fluid flows is approximately 0.062 inches (1.57 mm). In this embodiment, the channel runs from the container bottle for a distance of about 0.474 inches (1.2 cm) and then expands slightly as it communicates with the concavity to form the exit orifice at the distal end of the spout. Another method for removing soils from fabric articles that can be used with the compositions of the present invention is to initially encircle the soiled area to be treated (or substantially encircle if the soiled area is on an edge of the fabric article) with the soil removal composition prior to contacting the soiled area with the soil removal composition. The products of the present invention (soil removal and/or reducing composition plus, optionally, instructions for using) may be incorporated into kits in accordance with the present invention. In a preferred embodiment, a kit in accordance with the present invention comprises a soil removal composition and instructions for removing and/or reducing soils from an article, and optionally an absorbent stain receiver. An article, especially a fabric article that has been treated in accordance a method of the present invention is also within the scope of the present invention. Preferably such a treated fabric article comprises an analytically detectable amount of at least one compound (e.g., an organosilicone) having a surface energy modifying effect but no antistatic effect; or an analytically detectable amount of at least one compound having a surface energy modifying and/or feel-modifying and/or comfort-modifying and/or aesthetic effect and at least one antistatic agent other than the above-mentioned compound. 2. The composition according to claim 1 wherein the lipophilic fluid, typically present at from about 60% to about 99.95% by weight of the composition. 3. The composition according to claim 1 wherein the soil modifying agent is selected from the group consisting of hexamethyldisilzane, trimethylchlorosilane, trimethylsilylimidazole, bistrimethylsilylacetamide, bistrimethylsilyltrifluoroacetamide, N-methyl-trimethylsilylfluoroacetamide, trimethylsilyldiethylamine, N-methyl-N-t-butyldimethylsilyltrifluoroacetamide, and halo-methylsilyl-containing materialsdialkylacetals, tetrabutylammonium hydroxide, BF3, pentafluorobromide, fluoroacyl anhydrides, acyl halides, activated acyl amides, and mixtures thereof. epichlorohydrin; CNBr; alkyl aldehyde; NaCNBH3; and mixtures thereof. 5. The composition according to claim 1 wherein the surfactant component is present in the composition at from about 0.01% to about 10% by weight of the composition. 6. The composition according to claim 1 wherein the surfactant component comprises a surfactant selected from the group consisting of siloxane-based surfactants, organosulfosuccinate surfactants, AES, LAS, CaLAS or NH4LAS, and mixtures thereof. 7. The composition according to claim 6 wherein the surfactant component is a siloxane-based surfactant selected from the group consisting of a polyether siloxane, a polyethoxylated sulfate siloxane, a peptide siloxane and mixtures thereof. 9. The composition according to claim 1 wherein the non-solvent cleaning adjunct is chosen from the group consisting of builders, surfactants, emulsifying agents, enzymes, bleach activators, bleach catalysts, bleach boosters, bleaches, alkalinity sources, antibacterial agent, colorants, perfume, lime soap dispersants, odor control agents, odor neutralizers, polymeric dye transfer inhibiting agents, crystal growth inhibitors, photobleaches, heavy metal ion sequestrants, anti-tarnishing agents, anti-microbial agents, anti-oxidants, anti-redeposition agents, soil release polymers, electrolytes, pH modifiers, thickeners, abrasives, divalent ions, metal ion salts, enzyme stabilizers, corrosion inhibitors, diamines, suds stabilizing polymers, solvents, process aids, sizing agents, optical brighteners, hydrotropes, and mixtures thereof. 11. The composition of claim 1 wherein the non-solvent cleaning adjunct comprises a bleaching agent, an enzyme, or mixtures thereof. 12. The composition of claim 1 wherein the lipophilic fluid is selected from the group consisting of: linear, branched and cyclic volatile silicones, and mixtures thereof. 13. The composition according to claim 12 wherein the lipophilic fluid comprises decamethylcyclopentasiloxane. 14. A method for removing and/or reducing incidental soils present on a fabric article in need of treatment comprising the step of contacting the soiled area of the fabric article with the composition according to claim 1, and optionally, placing the treated fabric article into a subsequent cleaning and/or refreshing cycle. 15. The method according to claim 14 wherein the subsequent cleaning and/or refreshing cycle comprises the step of contacting the fabric article with a lipophilic fluid. 16. The method according to claim 15 wherein water is present in the lipophilic fluid at from about 0% to about 10% by weight of the lipophilic fluid. 17. The composition according to claim 1 wherein the solvent mixture contains decamethylcyclopentasiloxane, water and a surfactant or apolar solvent. 18. The composition according to claim 17 wherein the solvent mixture comprises 85 to 100% decamethylcyclopentasiloxane, 5 to 15% water and 0.5 to 3% surfactant. 19. The composition according to claim 17 wherein the solvent mixture comprises 80 to 100% decamethylcyclopentasiloxane, 0.5 to 15% water and 0.5 to 20% polar solvent. 20. A method for removing and/or reducing incidental soils present on a fabric article in need of treatment comprising the step of contacting the soiled area of the fabric article with the composition according to claim 17, and optionally, placing the treated fabric article into a subsequent cleaning and/or refreshing cycle.